Optimize ex vivo T cell activation and expansion in translational research, while preserving functionality and viability. After gentle T cell isolation with our MACS® Technology solutions, activation can be either performed polyclonally or antigen-specific. Efficient and reliable proliferation ensures viable and functional T cells for any downstream application. 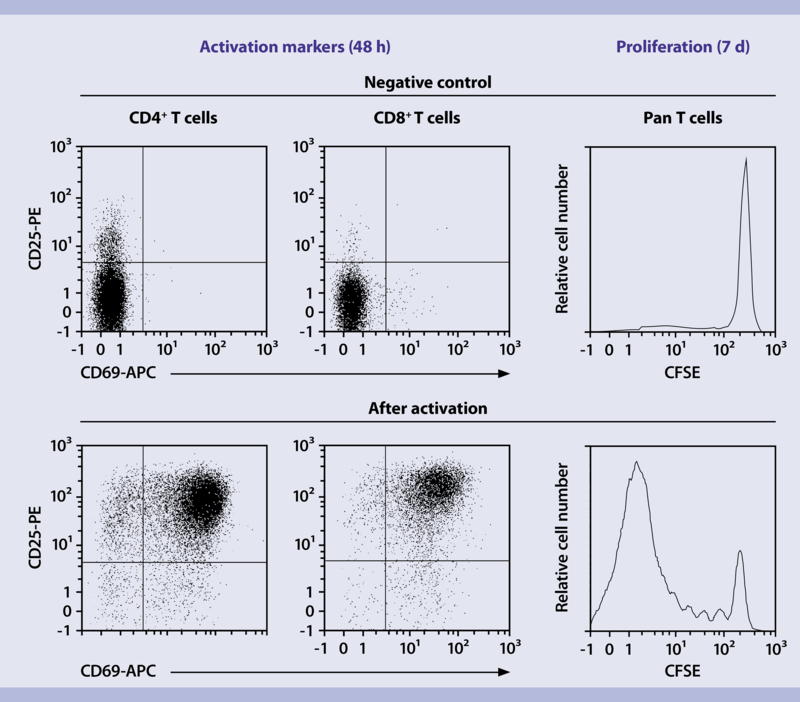 Our flow cytometry solutions enable highly accurate multiparameter T cell analysis. Reliability now comes with better performance and faster protocols. Our improved MicroBeads and T Cell Isolation Kits allow for high-quality separation of human and mouse T cells within a few minutes. Mouse CD4+ and CD8a+ T cells were isolated using either the respective CD4 or CD8a MicroBeads, mouse, CD4+ or CD8+ T Cell Isolation Kits, mouse as indicated. Subsequently, cells were cultivated in basal medium (RPMI + 10% serum). Analysis of activation markers CD25 and CD69 by flow cytometry was performed on a MACSQuant® Analyzer either directly after isolation (day 0) or 24 h after (day 1) with (+) and without (-) stimulation via the T Cell Activation/Expansion Kit, mouse. Regardless of isolation method (positive selection using MicroBeads or untouched selection using T Cell Isolation Kits) no significant difference (n.s.) in activation marker expression was observed. At day 1 after T cell isolation, strong expression of activation markers CD25 and CD69 was induced using the T cell activation/Expansion Kit, mouse, again with no significant difference with regards to the isolation method. StraightFrom® MicroBeads allow magnetic cell separation directly from human blood products, such as whole blood, buffy coat, leukoreduction system chambers (LRSCs) and leukopaks. CD4+ and CD8+ T cell subsets can be purified using the autoMACS® Pro Separator, the MultiMACS™ Cell24 Separator Plus, or manual separators. Peripheral blood mononuclear cells (PBMCs) were isolated from buffy coat using either StraightFrom Buffy Coat CD4 and CD8 MicroBead Kits, human or via density gradient centrifugation. 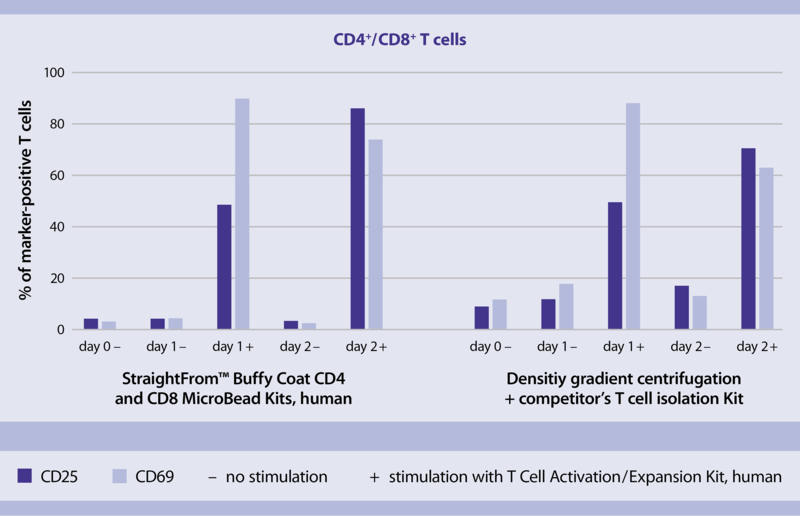 T cell separation was performed using either StraightFrom Buffy Coat CD4 and CD8 MicroBead Kits, human or a competitor’s untouched T cell isolation kit. Subsequently, cells were cultivated in TexMACS T Cell Medium. Flow analysis of activation markers CD25 and CD69 was performed using a MACSQuant® Analyzer either directly after isolation (day 0) , after 24 h (day 1) or after 48 h (day 2) with (+) and without (-) stimulation with the T Cell Activation/Expansion Kit, human. CD4+ and CD8+ T cells isolated with the StraightFrom Buffy Coat CD4 and CD8 MicroBead Kits, human showed hardly any expression of activation markers CD25 and CD69 directly after isolation, or after 24 h and 48 h of cultivation. Strong expression of both activation markers could be induced by stimulating T cells on day 1 and day 2 using the T Cell Activation/Expansion Kit, human. 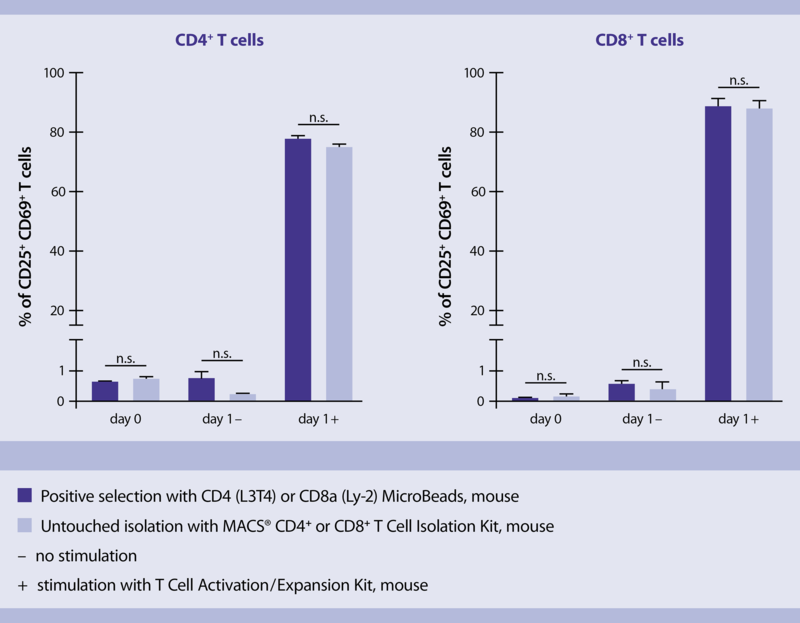 CD4+ and CD8+ T cells isolated via density gradient centrifugation for the generation of PBMCs followed by T cell separation using a competitor’s untouched T cell isolation kit showed higher expression of activation markers CD25 and CD69 directly after isolation as well as after 24 h and 48 h cultivation. When stimulating cells on day 1 or day 2, induction of activation marker expression was lower than compared to the cells isolated via StraightFrom Technology. 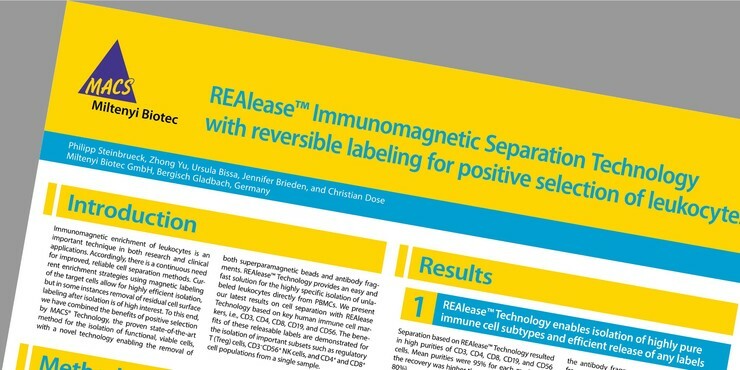 REAlease® Technology allows for magnetic cell isolation with subsequent removal of any beads and labels from your cells of interest. Clever utilization of recombinant antibody fragments allows for cell surface labeling in just a few steps. The technology relies on recombinantly engineered antibody fragments for cell surface labeling for highly reproducible results. The REAlease Biotin Complex binds to the target cells. Labeling of the REAlease Biotin Complex with Anti-Biotin MicroBeads allows for magnetic isolation of these cells. Following cell separation, both MicroBeads and REAlease Biotin Complex are gently removed, leaving the cells bead-and label-free. 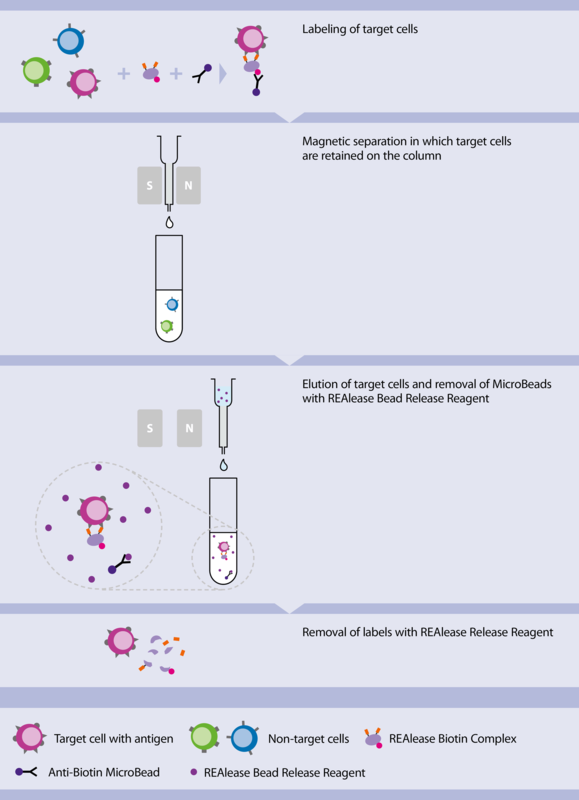 Enriched cells are then suitable for magnetic re-labeling and any application where label-free cells are essential. 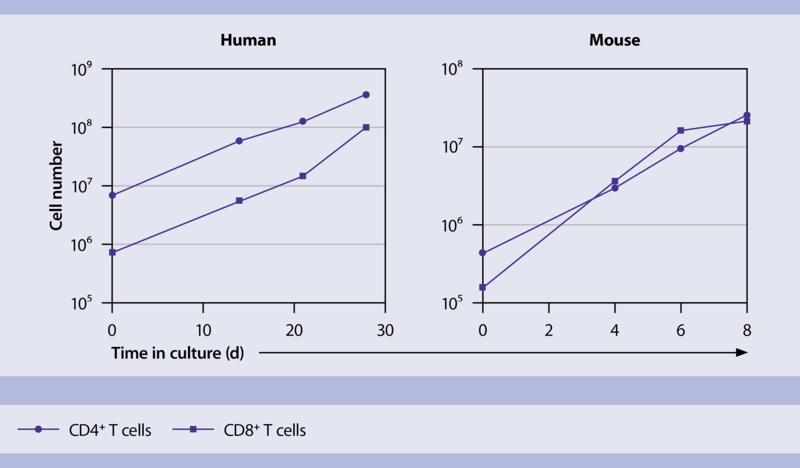 TexMACS™ Medium is an optimized, serum-free cell culture medium developed for reliable T cell and Treg cell culture results. Chemically-defined and without animal-derived components, it allows for the highest reproducibility in human and mouse cell culture applications. Human T cells were isolated from peripheral blood mononuclear cells (PBMCs) using the Pan T Cell Isolation Kit, human, and stimulated with the T Cell Activation/Expansion Kit, human. Cells were cultivated in the presence of IL-2 for 14 days in either TexMACS GMP Medium, TexMACS Medium, research grade, a competitor’s T cell medium, or basal medium (RPMI + 10% serum). CD4 and CD8 expression was analyzed via flow cytometry on a MACSQuant® Analyzer and cell expansion was evaluated by cell counting at culture onset and after 14 days of culture. 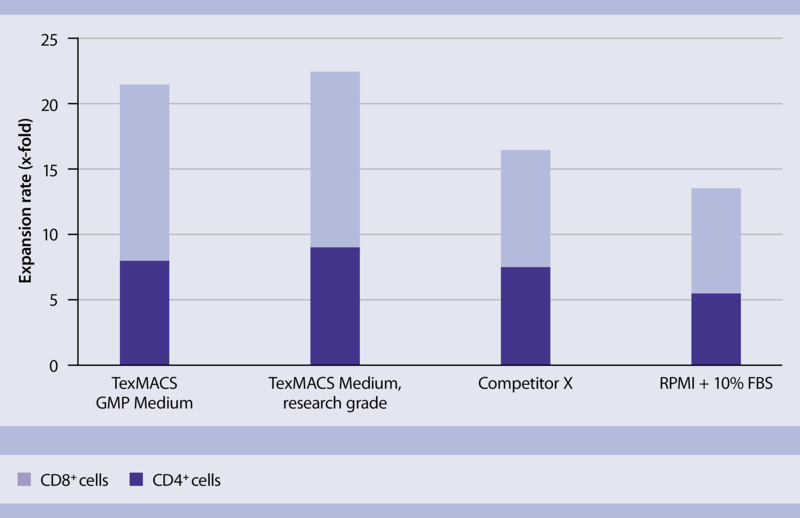 Highest expansion rates were achieved when cultivating T cells in TexMACS Medium (MACS GMP and research grade) compared to a competitor’s T cell medium or basal medium. Human and mouse T cells were isolated using the respective Pan T Cell Isolation Kits. Purified T cells were activated with the respective T Cell Activation/Expansion Kit and cultured in basal medium (RPMI + 10% serum) in the presence of IL-2 for the indicated time periods. CD4 and CD8 expression was analyzed via flow cytometry on a MACSQuant® Analyzer and cell expansion was evaluated by cell counting at culture onset and after indicated days in culture. Human T cells were isolated using the Pan T Cell Isolation Kit, human. Purified T cells were stimulated with T Cell TransAct, human and cultured in TexMACS Medium containing IL-2 for the indicated time period. CD4, CD8, CD25, and CD69 expression was analyzed via flow cytometry on a MACSQuant® Analyzer. Proliferation was measured using the cell division tracker CFSE. T cells activated with T Cell TransAct, human showed high expression of activation markers CD25 and CD69 after 48 h, as well as strong proliferation after 7 days of culture. PBMCs were isolated via density centrifugation and stimulated with the CytoStim Reagent, Staphylococcal enterotoxin B (SEB), or PMA/Ionomycin (positive control). Responding T cells were analyzed according to their expression of CD4 and CD8, as well as activation marker CD154 and secretion of IFN-γ via flow cytometry on a MACSQuant® Analyzer. Cells stimulated with the CytoStim Reagent show a higher expression of activation marker CD154, while the expression of IFN-γ is similar compared to cells stimulated with SEB. This indicates that the non-toxic CytoStim Reagent is a suitable alternative to the toxic SEB. Data from two different donors are shown (triplicates). The respective PepTivator Peptide Pools efficiently activated T cells in an antigen-specific manner leading to the secretion of IFN-γ of both CD4+ and CD8+ T cells.